Twelve years after releasing his debut, David Gray is still singing about broken dreams, regret-filled lives, and doomed relationships, but what’s changed is the maturity of his material. After scoring a hit with Babylon from his self-financed outing White Ladder, he embraced the major label money that inevitably came his way and used it on the subsequent A New Day at Midnight to take a huge leap forward by smartly enhancing his signature style with perfectly placed flourishes of orchestra and brass. Meanwhile, his lyrics continued to sketch the bittersweet beauty of life’s ups and downs — even as his musings turned more introspective and personal. 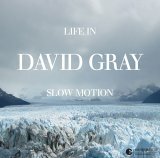 Gray’s seventh and latest endeavor Life in Slow Motion alters this approach only slightly, and most of the differences between it and its predecessor are designed to refine his work by further removing it from the skittering percussion that marked his biggest successes.